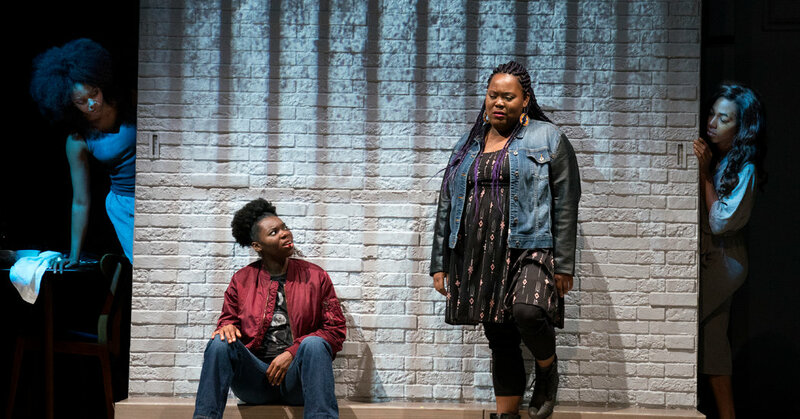 Several sharp and funny reasons are offered in “Eve’s Song,” Patricia Ione Lloyd’s disconnected, macabre comedy at the Public Theater, as to why horror movies are nothing to be scared of if you’re African-American, at least not after the first five minutes. By that time, the only black character will surely have been killed off. As to the dangerous behavior pursued by the survivors — like setting up a bed-and-breakfast in an obviously haunted house, or hanging out in a graveyard — no sensible black person would do that. Or so says the 19-year-old Lauren (Kadijah Raquel) to her younger brother, Mark (Karl Green), after proposing a family fun night with a slasher video. But then why does that mysterious crack in their dining room wall, the one beneath the copy of Ellis Wilson’s “Funeral Procession,” keep growing larger? Why do the lights go out for no apparent reason? And what about those three spectral women who keep wandering through the room? In “Eve’s Song,” which opened on Wednesday night under the direction of Jo Bonney, it soon becomes clear that everyday reality holds terrors for Deborah and her children that Gothic Hollywood fare could never top. Why? Because they are black citizens of these United States. This savvy premise was deployed as the basis for “Get Out,” Jordan Peele’s inspired hit horror movie of last year. And in interviews, Ms. Lloyd, a Tow Foundation playwright in residence at the Public, has described “Eve’s Song” as a sort of “queer female version” of that film. Those three restless specters I mentioned earlier? They are “spirit women,” phantoms of people who died violently and arbitrarily. One was a lesbian (Rachel Watson-Jih), one a transgender woman (Tamara M. Williams) and one an old lady (Vernice Miller) whose apartment was invaded by police who mistakenly thought it was a drug den. Why and how they have wound up in Deborah’s home for other than symbolic purposes is never explained. They don’t interact with the family members, and deliver their short, angry monologues directly to the audience. Rather than participating in and propelling the plot, they function as annotations or exhibits of its principal themes, a set of illustrative ectoplasm. That gap between story and symbol is typical of “Eve’s Song,” which remains a smart, vivid concept still in search of full dramatic development. What it has to say about black lives in peril is genuinely terrifying, but mostly in the way that sobering statistics or news analyses are. The production — which features a mutable haunted house set by Riccardo Hernandez with lighting by Lap Chi Chu and projections by Hana S. Kim — begins in a promisingly satirical vein, as the family gathers around the dinner table. Deborah, a business executive, has recently been left by her husband, and she’s doing her best to hold on to the illusion of a stable, wholesome middle-class life. Little things — like the ceremonial unfolding of napkins and pushing one’s chair neatly under the table — mean a lot to Deborah, played with a witty, fast-fading sitcom brightness by Ms. Aziza. She also insists on maintaining a flow of polite conversation about how everybody’s day was. What this family says and what it thinks, though, are entirely different. And each member is given a spotlighted moment to tell us what’s really on her or his mind. For Deborah, it’s the increasing racial insensitivity and sexual harassment she experiences at work, incidents she chooses to ignore as much as possible. “No one gets ahead by reporting things,” she says. That’s a tough double burden for any performer to pull off. Ms. Kelley (who appealingly played the title character in Kirsten Childs’s “Bella: An American Tall Tale” last season) doesn’t manage to reconcile the ambivalence with which her character has been written. But she’s a convincing object of desire for Lauren, who is still trying to figure out the specifics of her sexuality. It is as a lesbian identity story that “Eve’s Song” works best. The show is never more winning or convincing than when we’re allowed to spend time in Lauren’s head as she sorts out just who she wants to be. Ms. Raquel, a recent graduate of the State University of New York at Purchase, gives such a likably direct performance that you root for her throughout, even when her character makes some unlikely emotional U-turns. A soliloquy in which Lauren, who has joined Upendo in a protest “lie-in” on the streets, imagines herself dead is chilling in ways that the supernatural elements here never are. And it’s far more upsetting than even the climactic tragedy that ends this show. Her delivery is neither hysterical nor melodramatic as she envisions her own corpse in physically graphic terms. She’s pragmatically contemplating a possibility, of dying at the hands of the police, that seems all too plausible in this country, at this moment. That Lauren’s fears are realistic is a whole lot scarier than any cavalcade of ghosts.